Have you ever wondered, deep inside, why most U.S. dogs are neutered with a prescrotal approach while cats, sheep, goats, pigs, horses, bulls and exotic pets do just fine with a scrotal castration? Here’s the answer: There is no good reason other than habit, comfort, status quo and possibly a few misconceptions. For example, some colleagues believe that scrotal castration leads to more self-trauma. Experience and a literature search show that this is a myth. “As long as no external skin sutures are placed in the scrotum, there appears to be no greater risk of self-trauma in a scrotal castration than in a pre-scrotal castration,” Dr. Philip Bushby said at a conference.1 Dr. Bushby, a board-certified surgeon and semi-retired professor of surgery at the Mississippi State University vet school, is a big proponent of scrotal castration, and he possibly has the most experience on the topic. The scrotal technique, described in 1974, is a more recent, yet perfectly reasonable, safe and ethical alternative for both pediatric and adult canine castrations. The approach offers many benefits, including, depending on the technique chosen, reduced anesthesia time, less suture material, decreased cost, smaller incision, reduced pain, no risk of urethral trauma, and reduced likelihood of scrotal hematoma or seroma formation. When done correctly, the scrotal approach seems to significantly reduce the odds of patients’ self-traumatizing the surgical site during recovery. Overall, surgical time is cut by approximately 30 percent. So what’s not to love? Spay and neuter clinics and high-volume practices seem to be using this approach more and more. Reducing anesthesia and surgery time by even a few minutes is extremely helpful when you perform 20 or 30 castrations in a day. In general, any dog that is a candidate for pre-scrotal castration may be castrated via a scrotal incision instead. During preparation of the surgical site, care should be taken to minimize trauma, clipper burn and dermatitis. Tiny, low-powered clippers and a sharp clipper blade are ideal to clip scrotal hair while minimizing trauma to the sensitive skin. As with any surgical site, it is better to leave short hair than to be stubborn and cause micro skin lacerations. In turn, they cause pain and are an open route for bacteria. For your patient’s sake, please don’t cause clipper burns; this is a sure way to cause pain and encourage self-trauma. Next, gentle scrubbing is in order. Again, this is sensitive business. You are not scrubbing the bottom of your kitchen sink. Because it is easier to mobilize the testicles with a scrotal approach, the incision can be smaller than with a prescrotal incision. In addition, scrotal skin is more elastic than pre-scrotal skin, so an incision of about one-third of the length of the testicle should be enough. One way to decrease the risk of postop bleeding is to use a simple splash block.2 You can use a mixture of epinephrine for hemostasis (via vasoconstriction) and a local anesthetic drug such as lidocaine or bupivacaine. For example, you can use 1 part epi (1 mg/ml) and 9 parts lidocaine (2 percent) just before closure of the surgical site. Place a pressure bandage on the scrotum itself. Hold an ice pack on the scrotum. Consider keeping the patient overnight. Especially in an adult dog, avoid cutting visible, large cutaneous vessels as much as possible. Consider a scrotal ablation—and of course close the surgical site—in cases of sheer pendulous ugliness. After the surgical site is draped, a short incision is made along or just lateral to the median raphe, directly over the first testicle to be removed (usually the most cranial one). You can use the same technique as usual, i.e. open or closed. The spermatic cord is single or double ligated using your preferred method. Hemostasis is confirmed. The second testicle is then directed toward the same skin incision and removed in a similar fashion. Some don’t close the incision at all and let it heal by second intention. This is what has been done for decades in cats, horses and pigs. The open incision will lead to some drainage. Yet others compromise between the two concepts and place one buried subcutaneous suture to hold the wound edges together, while allowing drainage. Amazingly, there are very few studies about scrotal castration. One article3 and a thesis4 compared postoperative complications involving adult dogs that had prescrotal and scrotal castration approaches. No difference in the occurrence of hemorrhage, pain or swelling was noted with either technique 72 hours postop. The main differences were a shorter surgical time and less self- trauma with scrotal castration. This is noteworthy because many veterinarians believe that incising scrotal skin causes self-mutilation. This can be largely avoided by being gentle while clipping and scrubbing the scrotum, by avoiding skin sutures in the scrotum and, of course, by applying an E-collar. Another benefit of this approach is that the risk of accidental laceration or ligation of the urethra is nonexistent with the scrotal approach. In cases of incomplete or faulty spermatic cord ligation that results in postop hemorrhage, this can be identified quickly and addressed through the same surgical incision. To be fair, this has to do with poor surgical technique, not with the approach. If you choose a technique that allows drainage, client communication is critical to prevent unhappy pet owners. Your discharge instructions, verbal and written, should recommend a clean and dry environment for at least three days postop. They also should warn clients of a sero-sanguineous discharge if you don’t close the incision. Sleeping on a brand new couch or on white carpet is a big no-no. Conversely, if you choose to close the incision, educate your clients and tell them to expect scrotal swelling. Whichever technique you choose, an E-collar and standard exercise restrictions are recommended as you would after any castration. So dare to try a scrotal castration at your next opportunity. Your patients and clients will thank you for boldly embracing a new and improved technique. P. Bushby. North American Spay & Neuter Conference. Austin, TX, 2014. B.A. DiGangi et al. 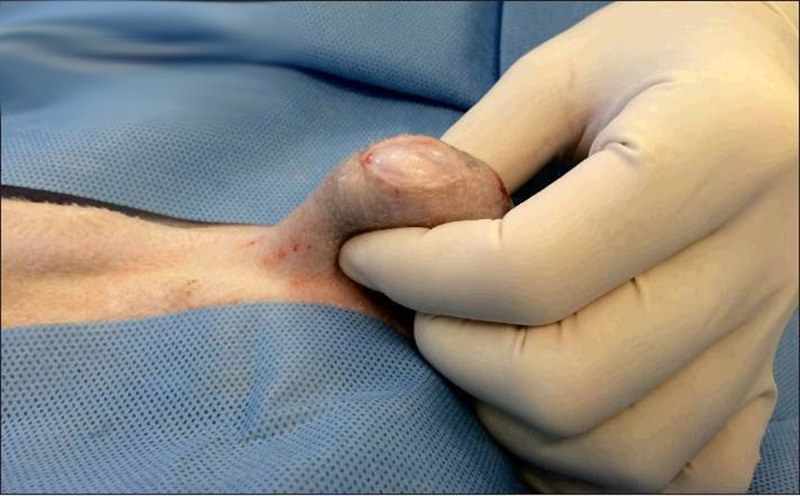 “Scrotal Approach to Canine Orchiectomy.” Clinician’s Brief, May 2016. K. Woodruff et al. “Scrotal Castration Versus Prescrotal Castration in Dogs.” Vet. Medicine, May 2015. K. Woodruff. “Scrotal Castration as a Safe and Effective Means of Male Canine Sterilization.” Mississippi State thesis, 2013. Dr. Phil Zeltzman is a board- certified veterinary surgeon and author. His traveling practice takes him all over eastern Pennsylvania and western New Jersey. You may visit his website at www.DrPhilZeltzman.com or follow him at www.facebook.com/DrZeltzman.